Obama’s budget is not philosophy…it is the product of a negotiation process, as opposed to an opening bid. It is, in other words, policy. You could argue that this is a philosophy, and that philosophy is pragmatism, but I think that’s getting too cute. This is the sort of policy that night pass and might work. Ryan’s budget is purer, but it is also more fantastical. It posits the government it wishes were possible, and the policies it wishes would work. It is an opening bid so ideological that it leaves little room for a process of negotiation. But I’d also like to register a philosophical protest. There’s an old joke to the effect that you’re an ideologue; I’m just being sensible. The point is that everyone has an ideology — which is another way of saying that everyone has (a) values and (b) some view about how the world works. And there’s nothing wrong with that. As a philosophical matter I believe Krugman is correct. There is no policy without ideology/philosophy. Yet Ezra offers a relevant distinction between ideology and policy: the former ignores the prospects of an idea becoming law while the latter takes that into account. Ezra’s distinction is potentially useful, and shows that we tend to define “ideology” and “ideological” in ways other than its purely philosophical designation. I want to offer my own definition of “ideological” in the context of modern politics and then tie it back to a previous post on how we identify values in political arguments. To me, a person is “ideological” to the extent that they place value on government’s role in a certain sphere of policy, on one side or another. For instance, if you place value on government not involving itself in the provision of healthcare, that makes you ideological. It may still be that once the facts are considered, you end up supporting a role for government, but your starting point places initial value on finding a solution that doesn’t require government. Your scales for considering the issue come pre-weighted against government involvement. It is in that sense that I believe Obama is truly a pragmatist. On the question of the scope of government he is likely to ask “what does the government do well, and what does it do poorly, relative to our other goals”, whereas a more ideological figure would ask “does government do x well enough/poorly enough to overcome our presumptive value for/against its involvement in this sphere”. I see the identification of sacredness as a crucial challenge in the public sphere, and therefore a crucial challenge within media. I want to use the definition of ideology that I’ve laid out to give a semi-concrete example of what I mean. Let’s assume that when it comes to healthcare, Obama is a pragmatist in the sense I’ve discussed. He’s worried about welfare, equality, etc. but approaches the question of the role of government in healthcare pragmatically. But does Paul Ryan approach that question in the same manner? 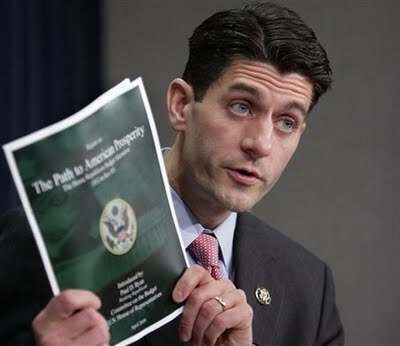 Or is it possible that when considering the appropriate role of government in healthcare, Ryan’s scale comes pre-weighted, perhaps even just slightly, against government involvement. Perhaps limited government is a “sacred value”, in a Haidtian sense, to him and to his supporters. If so, that’s something we, the public, should know. So how do we find out? One way is simply to get the facts straight. If we weigh the arguments on the unweighted scale, find the argument for government involvement compelling in that context, and then see Ryan still favoring less government, that might suggest the existence of a sacred value. So classic fact-checking and analysis can help us back into the identification of values. But I wonder if we might also do some work on the opposite end, by identifying the values first. And I wonder whether that might help us back into our analysis of the issue. If we can identify up front that Ryan places inherent value on limited government (what I’m calling an ideological approach) then we can treat his arguments about the pragmatic merits a bit differently. Perhaps it means we are less likely to trust certain arguments of his. Perhaps we just bear in mind that in his view arguments against government involvement have a lower bar to clear. In any case, it’s something we want to know and something we may be able to use media to help uncover.